Thank You Donors & Volunteers – EDS Wisconsin, Inc.
A HUGE thank you to all of our donors, it is because of you that we are able to achieve our mission of providing support and resources to doctors and patients throughout Wisconsin in 2018. To date, we have created six in-person support groups throughout Wisconsin; further, we’ve provided resource materials to many doctors and patients in need and were able to provide grant monies to two teens to attend a pain conference. Additionally, we held a very successful Meagan’s HOPE Memorial Walk for EDS Awareness and Suicide Prevention which brought 186 individuals together in one place in 2018, traveled to Chicago as EDS panelists for medical students, began working on a leadership program with national organizations, made lots of connections between patients and providers, and have many exciting events currently being planned. 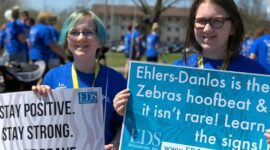 It is EDS Wisconsin’s greatest honor and pleasure to thank each and every one of you from the bottom of our hearts on behalf of everyone who either has EDS or has been affected by EDS! Together we are making a difference. Thank you!